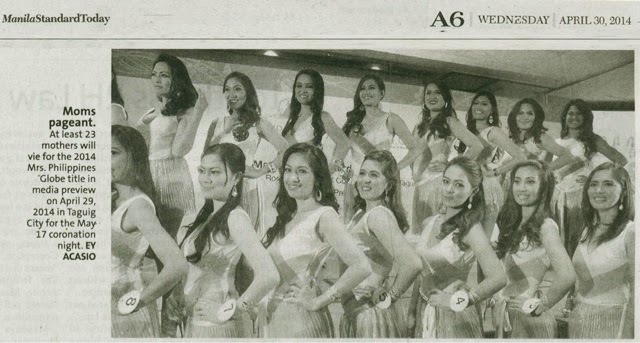 One of our most awaited pre-pageant activities was the Press or Media launch for us 23 candidates. Not only did we get to showcase the pretty swimsuits created by Jonti of Galatea but we also finally got to introduce ourselves. Call time was early at 630AM to ensure that we could rehearse and prepare. As soon as Director Raymond arrived we strutted to the SMX Meeting rooms 4-6 of SM Aura to strut our staff. Blocking is the term used when you are teaching the models in what way to ramp, and it is so not easy. You definitely have to have a sharp mind to remember everything. Walking with the beautiful ladies was great and exciting. We would also giggle at the mistakes we made but made sure to make up for it by doing better the next round. We had a "holding room" where all the contestants would stay and where we would change as well as do make-up. The hustle and bustle of everyone trying to make sure they looked perfect was an adventure. I actually did my own hair as well as for candidate number 5, Grenjen. There was also last minute adjustments to the swimsuits. A few minutes after we were called and were given a quick briefing by Director Raymond as well as a good luck wish. Lined up outside the door of the meeting rooms, we all excitedly waited, then as soon as the doors opened it was show time! Lights were bright and there were a number of photographers eagerly waiting to take photos. I felt such a rush walking on the ramp as well as getting photographed, but the best part was seeing my friends from Mommy Bloggers Philippines. That truly gave me a boost of confidence. 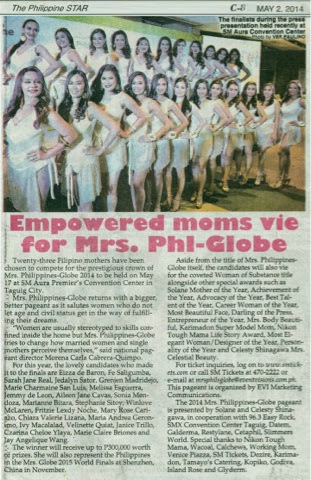 We had TV5 and ABS-CBN as well as a few publications like Philippine Star and Malaya. There was also a brief question and answer portion, where I also got to answer a question asked by Lani Lluch of Tweensel Mom. Tired but truly happy, our day didn't end with the press launch since we still had our Ball Gown fitting. It was the heaviest thing to wear because of a large petticoat made of cloth and heavy wire, good thing my co-candidates were able to amuse themselves with all the heaviness.